Xiaomi will start selling the Black Ceramic Edition and the Starck Edition Mi Mix 2 on November 28 with China being the first market to get it. Until now only the White Ceramic was available for purchase. The Starck Edition has the phone's designer, Philippe Starck's name inscribed on the back but is otherwise a Mi Mix 2 with 8GB of RAM and 128GB of storage. 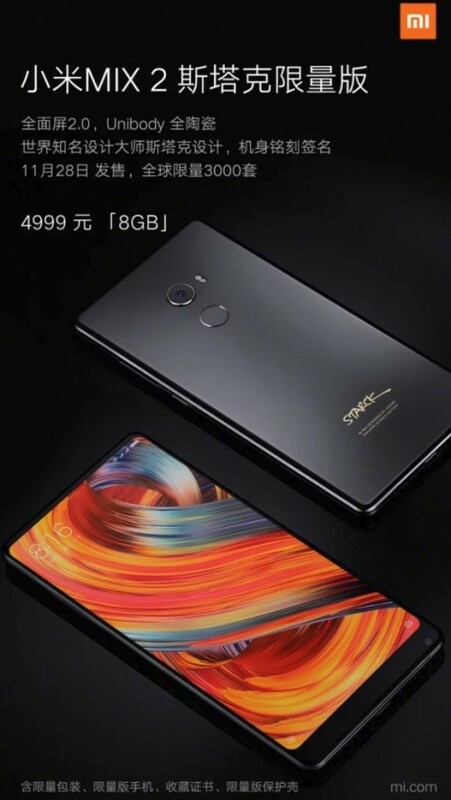 The price of the Stark Edition Mi Mix 2 is 4,999 CNY (€641) while the Ceramic Black model is priced at 4,699 (€600) - both will be available from November 28. No 4000 mAh no buying Xiaomi.